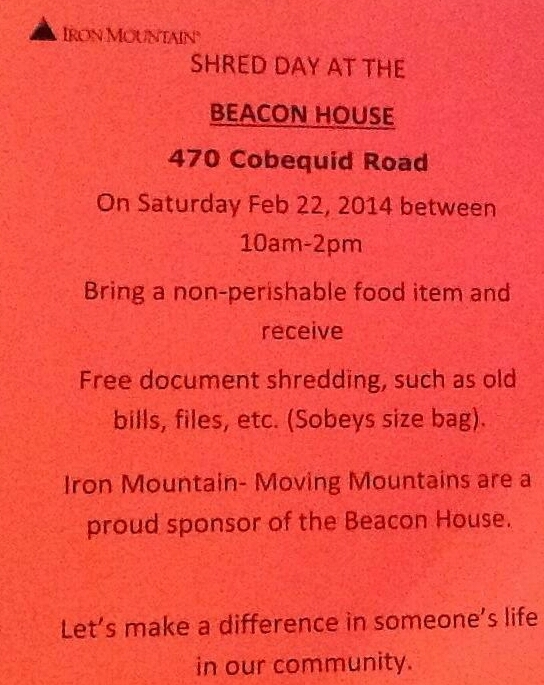 Iron Mountain “Shred Day” At Beacon House Feb 22 # Sackville | Sack-Vegas!!!! The good folks at Iron Mountain are offering to do some free shredding in exchange for a food donation to Beacon House. Bring some old documents down, donate food and feel good about it. Win-Win ! Check the above pic for deets. One question….If I bring a box of Shreddies do I get a bonus? Zing! Posted by Sacky on February 5, 2014 in Community Events.